FREE SOLO – the name comes from the freeclimbing scene, it means climbing a route without technical aids, completely on your own. Highly experienced and professional climbers climb a route in this way while experiencing a high intensity of life. 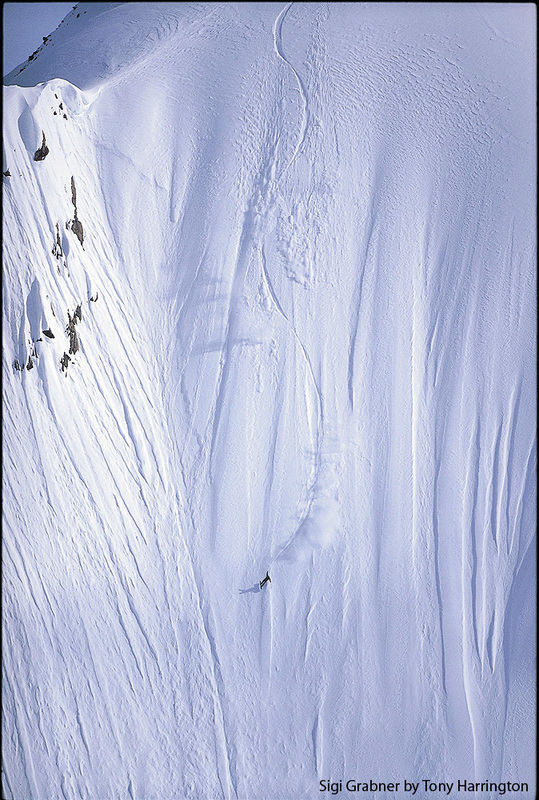 The first line to draw in a virgin powder slope, alone with yourself and the world – this is the real dream of every snowboarder. Maximum joy for hours riding through deep snow and untouched terrain. 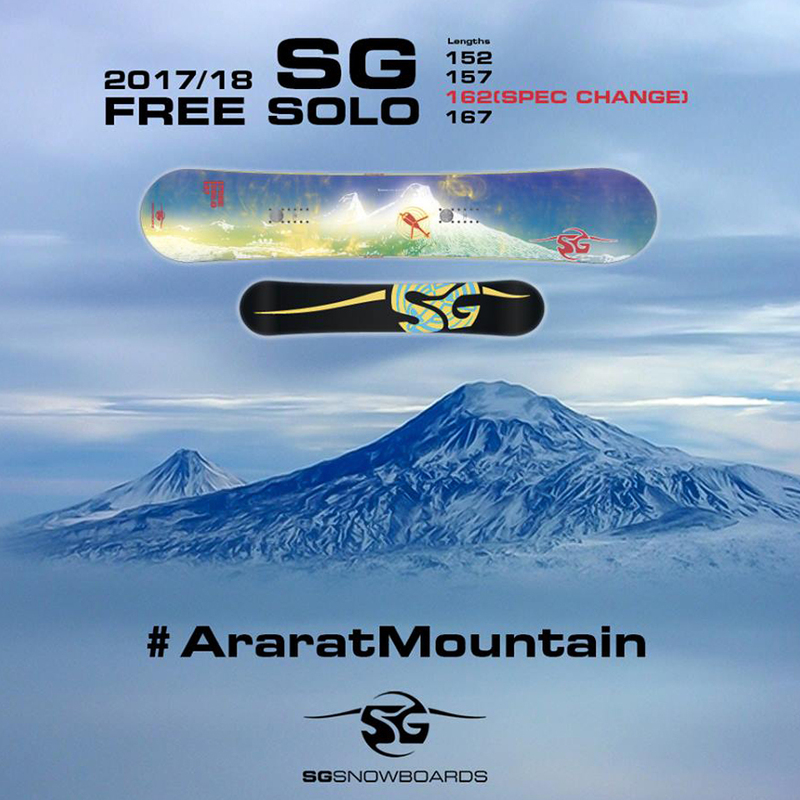 Our SG FREE SOLO series is dedicated to this snowboarders’ dream of epic riding on the mountain. Each year we choose a big mountain, where our riders have experienced this great feeling (and tell us bright-eyed stories about) and add it to the FREE SOLO board series. Check out the GPS coordinates on each FREE SOLO edition indicating the selected line. The FREE SOLO 2015/16 edition is featuring the steep slopes of New Zealands highest peak “the Aoraki”/ Mount Cook 3.724 m. Aoraki Mount Cook National Park is home of the highest mountains and the longest glaciers. It is alpine in the purest sense – with skyscraping peaks, glaciers and permanent snow fields, all set under a star-studded sky. According to Ngai Tahu legend, Aoraki and his three brothers were the sons of Rakinui, the Sky Father. While on a sea voyage, their canoe overturned on a reef. When the brothers climbed on top of their canoe, the freezing south wind turned them to stone. The canoe became the South Island (Te Waka o Aoraki); Aoraki and his brothers became the peaks of the Southern Alps. A wonderful story for epic freeriding sessions on the highest mountains of New Zealand. The FREE SOLO 2014/15 edition is dedicated to Khan Tengri. It is a mountain of the Tian Shan mountain range. It is located on the China – Kyrgyzstan – Kazakhstan border, east of lake Issyk Kul. Its geologic elevation is 6,995 m (22,949 ft), but its glacial cap rises to 7,010 m (22,999 ft). For this reason, in mountaineering circles, including for the Soviet Snow Leopard award criteria, it is considered a 7,000-metre peak. The name “Khan Tengri” literally means “King Heaven” in Kazakh and possibly references the deity Tengri. In some other local languages, it is known as Khan Tangiri Shyngy, Kan-Too Chokusu, Pik Khan-Tengry, and Hantengri Feng. Khan Tengri a massive marble pyramid, covered in snow and ice. At sunset the marble glows red, giving it the Kazakh/Kyrgyz name Кантау/Кан-Тоо (blood mountain). The mountain is also the world’s most northern 7,000-metre peak, notable because peaks of high latitude have a shorter climbing season, generally more severe weather and thinner air. Best conditions for snowboarders! 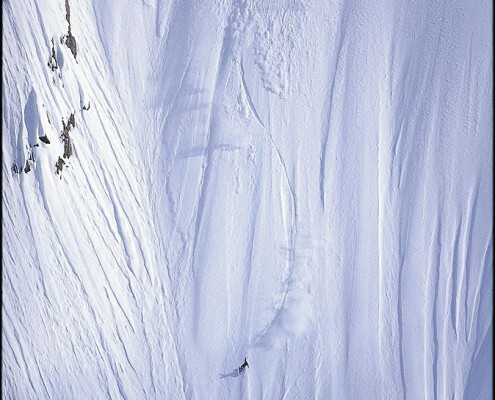 Ueli Kestenholz and I were shooting for some snowboard film in Alaska in 1999. We would ride the so-called “Stairs”, which is a mountain range in the Chugach Mountains. It was not about “excitement” like in a competition, but it was about something different. It was something “existential” as life itself: You must know that the snow in Alaska is different than snow in Europe, its consistency and structure is different from that we know from European mountains. You would have to take this in consideration and watch out in these extremely steep descents, take this easy flow of snow in the slopes, which you would detach at every turn, accept the slow slides beside you like mini avalanches. When I had my first contact with that flow, its power almost tore my board from my feet. I crashed and was hurled down 100 feet at one stroke. Well, yes! Of course, we had chosen a line in the most difficult descents in the Chugach Mountains: a 60° steep slope. It was a mountain massif which seemed impassable. We had studied it meticulously several times from our helicopter, shooting pictures with a Polaroid camera. We studied the maps, we studied the photos still in the helicopter, drawing the line into our brain, where we would go down. It had to be burnt into my memory – where I had to make each turn, where to avoid the flowing snow. – Then we left the helicopter, Ueli and I, and went down on an eternally long ride: We took our turns, we changed the channels, we rode it down, exactly as planned. 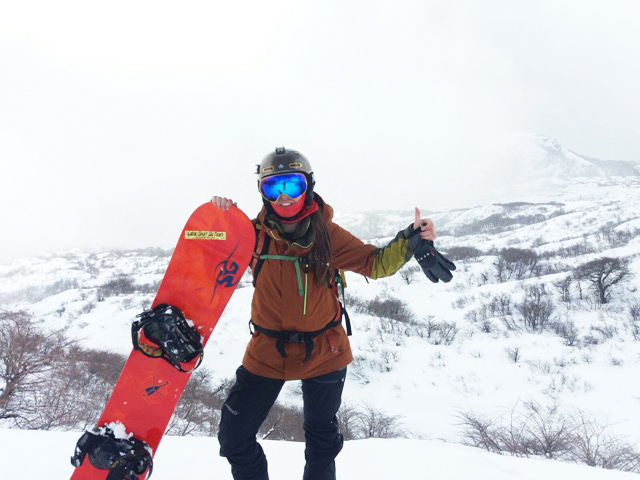 In every moment of this “ride for the eternity” I was fully aware of everything – one mistake and you’re gone, and the snowboard world will turn without you. – It went well. The Dolomites and in particular the famous “Tre Cime” have been Sigi Grabner’s home mountains since the times when the Burton Alpine Team used to have their training camps here. Sigi has even lived in Sesto/Sexten, near to the “Tre Cime” montains for several years, due to his love for these mountains. But there is one more member of the SG PRO TEAM who is a home boy in the Dolomites: Roland Fischnaller aka “Fisch”, who is a true mountain man. Fisch was born in the Dolomites and loves the mountains with all his heart. Fisch is in fact a certified mountain guide and a member of the Mountain Rescue Squad in Funes. 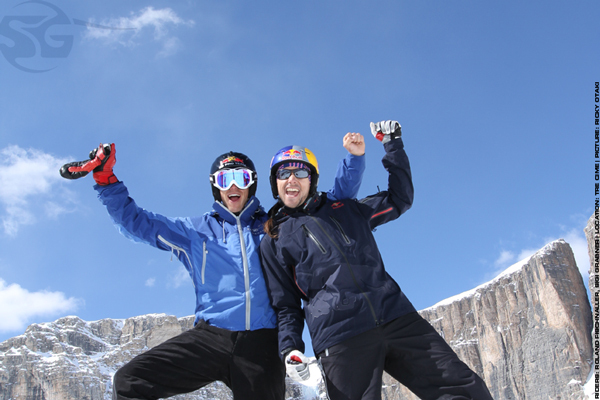 The love for the Dolomites connects them, Sigi and Fisch, both in summer and in winter for climbing, paragliding, back country snowboarding and powder shredding. So we decided to dedicate the 2009/10 FREE SOLO series to the “Tre Cime” Dolomites and to true companionship on the mountain. 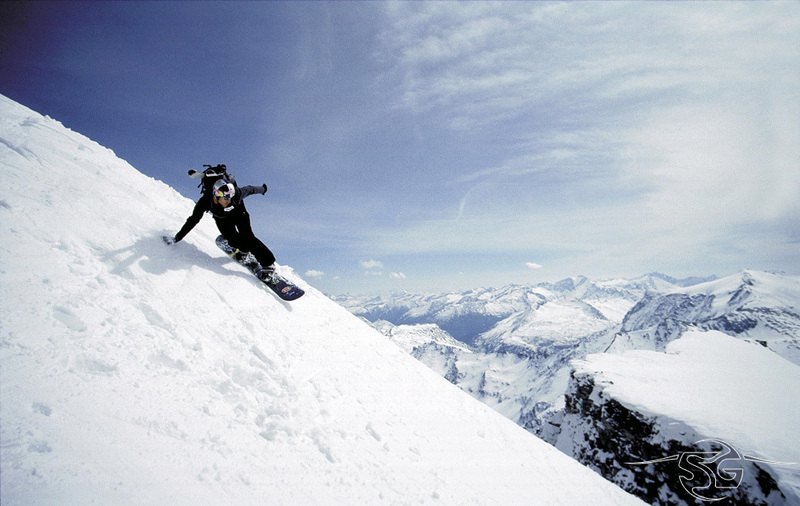 The Grossglockner mountain peak is the theme for the 2008/1009 FREE SOLO board line and it stands for taking the right decisions on the mountain.